No more worthy a source for good tape information than Shurtape lets us know that duct tape is not the right product to use on ductwork. 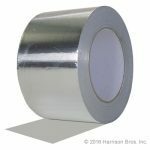 In their Tape University series, the experts at Shurtape say that using utility grade duct tape to seal, repair or couple sheet metal duct work will fail, often in just a few days. Their recommendation for duct repair-foil tape.